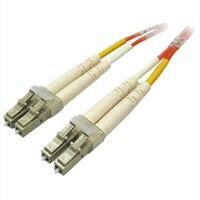 Multimode LC/LC Fiber Optic Cable-1mThe Dell™ Multimode LC-LC Fiber Optic Cable is used to link your fiber networking devices for high-speed, long-distance connectivity. This 1 meter cable features an LC connector at one end and LC connector at the other end. The Dell™ Multimode LC-LC Fiber Optic Cable is used to link your fiber networking devices for high-speed, long-distance connectivity. This 1 meter cable features an LC connector at one end and LC connector at the other end.